Tra On is just over an hour downstream the Bassac. Quang Duc Pagoda one of the biggest and most active Buddhist temples. Phung Hiep is much farther away, in the neighbouring Hậu Giang Province. Phong Dien is further up the Can Tho River, and worth seeing as it is a retail market. Ninh Kieu dock, with Ho Chi Minh statue standing still, is the symbol of Can Tho city. 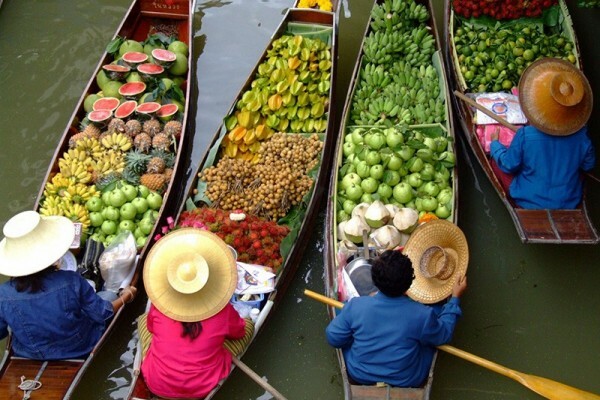 Cai Rang Floating Market is the main wholesale floating market near Can Tho. Phong Dien Floating market is bustling best between 6am and 8am. The market is 20km southwest of Can Tho; most get here by road. Can Tho is one of the cities which is belonged Mekong River Delta, if you visit the Mekong River Delta is Can Tho city is one of most worthwhile highlight for you to explore on your trip to this water river area. What sightseeing must see in Can Tho? With the most famous two floating markets in Vietnam are Cai Rang Floating Market and Phong Dien Floating Market, Can Tho is also known as one of the most developed cities in Vietnam. Discovering Can Tho by boat is the best choice for you, you could have a choice to sit on a small wooden boat and the locals at here will row it around the river as well as around the small canals so it will be easy for you to take park in the different activities with the locals on the floating markets such as buy and try the fresh local fruits directly from the boats, hearing the folk songs of the locals, take the most beautiful photos from your boat, buy the most special souvenirs of this area….all of these special activities are so fun and memorable for you. With the families whose travel with kids is this is a good chance for them to find about the daily life of the people whose live and do their business directly from their houses or these houses are their boats, they are not rick but they always smile and friendly with all tourist whose arrive to explore about their customs and habits. What is the special food in Can Tho? Can Tho is also known with the famous Ninh Kieu pier where has a lot of the different kinds of boats and floating restaurants with vary seafood and Vietnamese traditional food. Exploring Can Tho, you also should not miss the local food at here, they are very special such as Cai Rang grilled meat roll, Turnover, Cylindric glutinous rice cake….People in Can Tho are also very friendly, many families live on the small boats in the river, although they are still poor they are very enthusiastic, they could talk with you all time and help you anything you need or suggest you the necessary things to do at here. Exploring Can Tho, beside you visit the famous sightseeing such as Cai Rang Floating market, Phong Dien floating market, Ninh Kieu pier you also should not miss to visit hicks of the locals at here, this special activity is very famous and popular with all tourist once they visit Can Tho. Walking the hicks of the locals at here you have a chance to choose and try any fruit you want, all these fruits is very safe for you to eat directly as soon as you pick it, while you try the fresh fruits you are mixed with the fresh air in the large hicks with a lot of the different fruits, this activity is really fun and you must included it on your trip to this area because there is very little destinations where offer this special activity around Vietnam. Bang Lang Stork Garden is also very famous in this famous city, it is located in Thoi Thuan commune, Thot Not District, Can Tho city. You must take a boat trip to go inside this stork garden, you will see a lot of the different kinds of stork at here, you should visit this place in early morning to be seen these storks go out for food until around 5pm they return their home at here. How to go to Can Tho? It takes around 170km from Ho Chi Minh City to Can Tho by bus, normally you should take a trip 2 days 1 night in Can Tho to see full sights at here, you also can stay overnight with the local family in this water river city to experience all what a large and river water city is still available. Can Tho is one of the largest central four cities in Vietnam, this city is very famous with the biggest two floating markets in the Mekong River is Cai Rang floating market and Phong Dien floating market, taking a boat trip on these two floating markets the tourist have a chance to find about the daily activities of the locals at here, try the local food directly on the boats, rowing on a small boat around the small canals….all these activities are very worth for you. Where should stay in Can Tho? Almost of hotels are located in the center of Can Tho city, there are enough kinds and class for you to choose to book and stay, from the guesthouse to 4 star hotels, from the cheapest hotels to the most luxury hotel as Victoria Can Tho….all of them is located in the center and around of Can Tho City.